We had a great time at the National Association of Home Builders annual International Builders’ Show in Orlando, Florida. Our Head of Strategy Rob Galletta brought Blackjet’s fearless innovation to an international stage at one of the biggest and best IBS events in recent years. The NAHB’s focus on community building and creating cutting-edge home development solutions has lead organization members to build a staggering 80% of new homes in the United States every year. Blackjet was brought on board to share our strategic expertise in place making and branding. 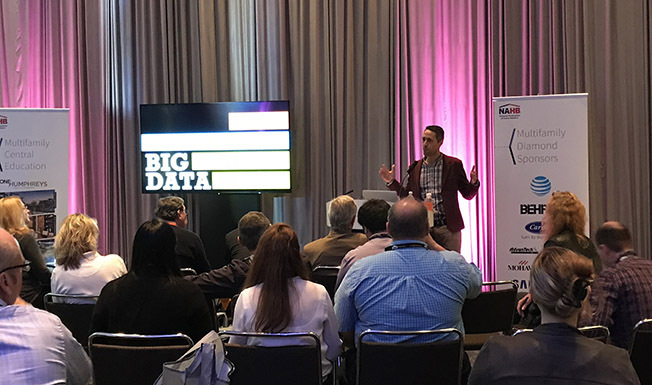 Rob lead a session on how to use data and consumer insights to fuel a competitive advantage in the home building industry. The presentation focused on inspiring fresh new design and lifestyle concepts, as well as creating dynamic brand campaigns that outperform the competition. Using case studies from our client partners, Rob shared Blackjet’s unique understanding of how to unlock the potential in every project. He discussed how we approach place making and place branding based on an industry leading understanding of the real estate development market. Big thanks to NAHB for hosting an incredible event, and we look forward to connecting more of our international client partners with fearless creative work in 2018.